Preheat oven to 350F degree. Line a large sheet pan with foil. 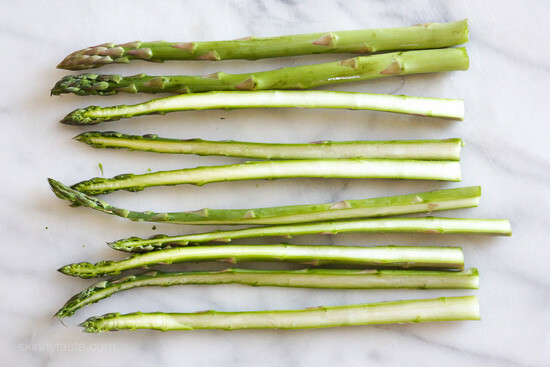 Cut each asparagus spear in half lengthwise and then into 1-inch pieces. Place in a small bowl with garlic, 1 teaspoon olive oil, 1/8 teaspoon salt and pepper, to taste. Toss to evenly coat. Heat a large non-stick skillet over medium heat. Transfer asparagus from the bowl to the skillet and sauté until it softens slightly and browns around the edges. 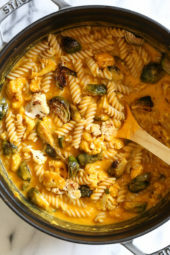 Remove from heat and place back into bowl. Set aside. 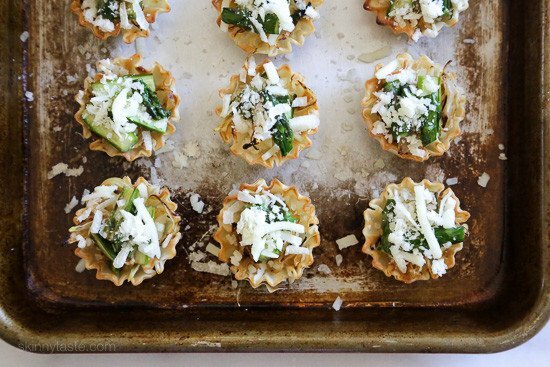 To assemble tartlets: In each shell, layer ½ teaspoon mozzarella cheese, then onions, asparagus pieces and top with more mozzarella and parmesan. Bake for 10 minutes or until the shells are crisp and the cheese is melted. 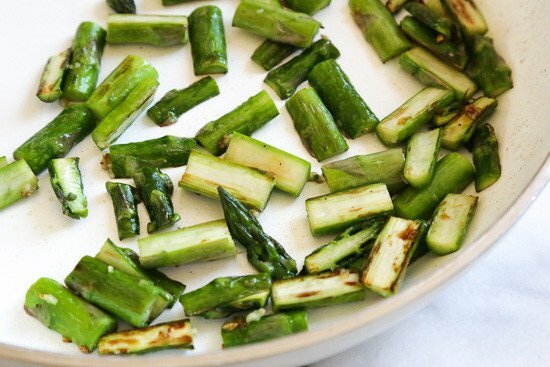 Garnish with chives and serve right away. Tried these tonight, they were absolutely delicious! Any advice on making these in advance? 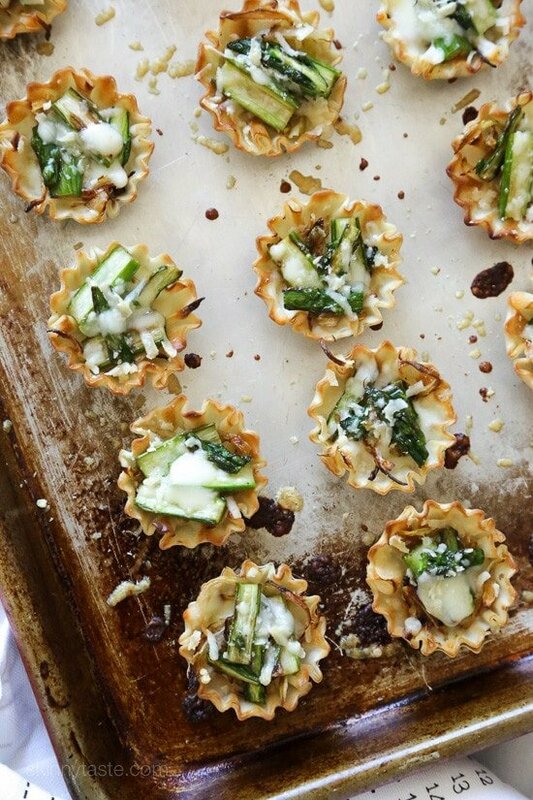 Is there an advantage of using a sheet pan over a mini muffin tin? 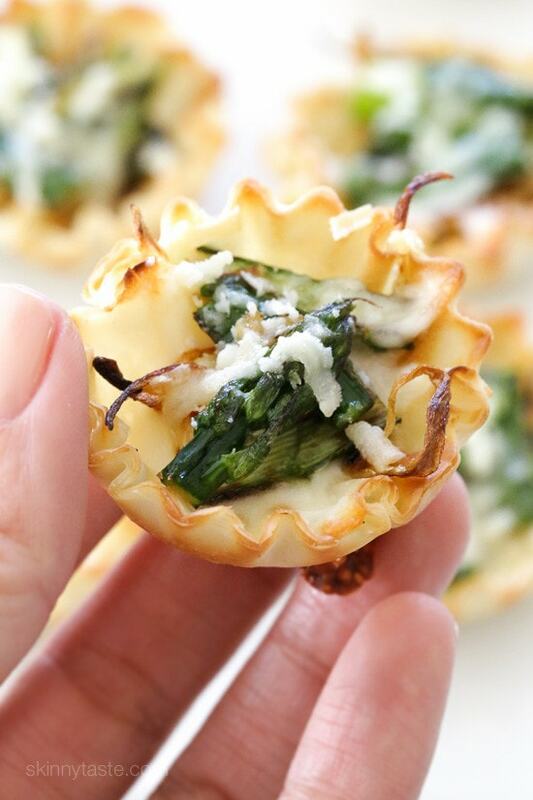 I’ve never cooked with the mini phyllo cups before. My husband refuses to eat asparagus (which I love). Any suggestions for a substitute vegi? People’s taste buds change over time. I’d make them and ask him to at least do a “no thank you” bite. I didn’t like asparagus until about 3 years ago. I couldn’t get past the texture, but if they are small stalks I like them. Broccoli and onions go okay together,. IToss some chopped up bacon bits in with it? Kale or spinach may work? Both go well with onion. 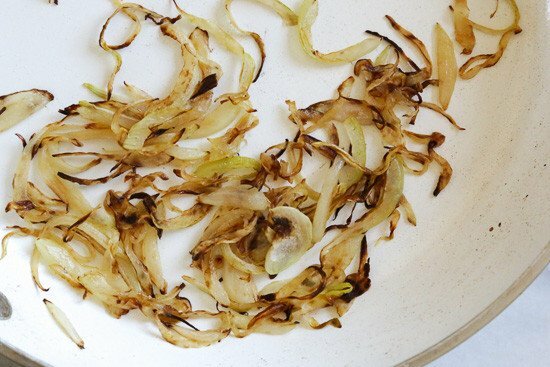 Can the asparagus and onions be made in advance, refrigerated, and then assembled another day when needed? I cooked the Loaded Baked Omelet today and made my husband a very happy man ! He laughed at me because I wanted to try them so bad. 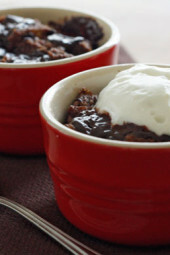 I just started Weight Watchers and am looking for different things to make & when I saw you even have the smart points added in I was so excited. These omelets were the best !! 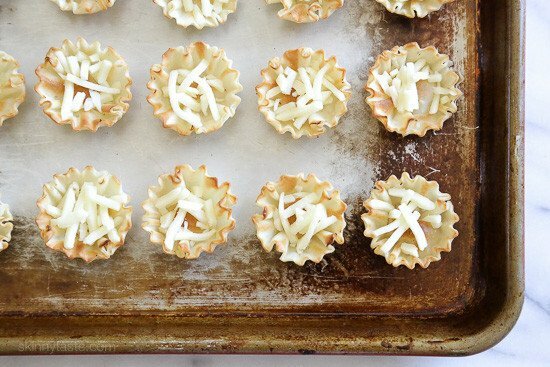 Do you have any more ideas for other dishes in the cupcake pans? Or any desserts? I can`t wait to tell everyone about this on Face Book. Thank you. 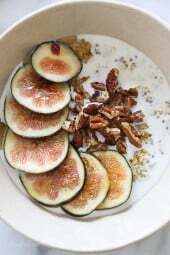 Just found your blog and I have to say this is quite a showstopper! YUM! Love how you can prep ahead too. I loved this! I made for an Easter appie and everyone was eating it up and commenting. Easy. Will do again and again. I just wanted to compliment on your new blog design, I love it!!! Wow, these really look great! This looks delicious!! 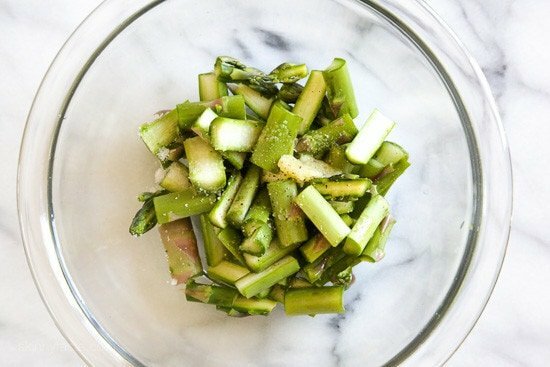 Love asparagus, and I am sure this would make a perfect appetizer! Help! I'm scared! Store didn't have minis so I bought phyllo sheets. Need tips on preparation please!!! Here's how I layer phyllo for strudel: Lay out one phyllo sheet. Spray it with Pam or olive oil from a Misto. Sprinkle with just about 1 T of bread or Panko crumbs. Layer 3 sheets together in this way. I would think that at this point you could cut the large layered sheet into squares and fit them into mini muffin tins, they spritz again lightly with Pam/oil. Maybe worth a try??? Good luck! Thank you, Liz M. I'm not sure I realized I need to use mini muffin tins, duh! And never thought of bread crumbs. Is that to keep it loose and not clumped together? Haha, okay, Liz M. after a cup of herb tea, more reading and reading your post again I think I got this. YOU SAVED EASTER LOL. The only thing I need is bread crumbs. Thank you so much. LOL sorry I am just reading this now, thanks for helping Liz!! Wow. 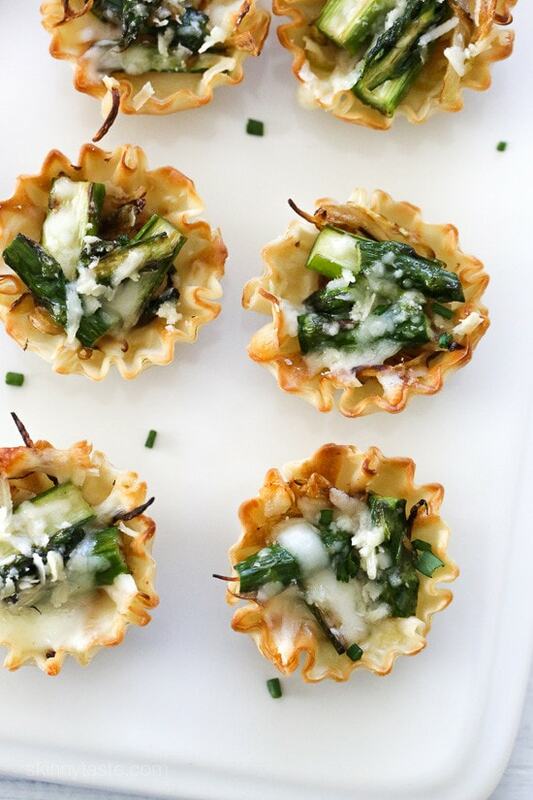 Cheese and asparagus in a bite-sized tartlet. Yum. These looks so delicious and super cute. I love the green color, a must for any table. Delish! I can literally feel the crunch of each bite through the photos! I love asparagus! These look delicious. As a side note, can I ask what brand of pan/skillet do you use? It looks perhaps ceramic? Or can anyone recommend a non-stick or ceramic pan they are happy with? Looks amazing, I would assume could be made into a full sized quiche…..I too would love to,know which sauté pan you used. Looks very nice and interesting. I have two Oster DuraCeramic pans from Target that I love. Nothing sticks at all. Thanks Liz! I'll look into that one also. I bought my skillet at Home Goods, it's ceramic.